Punjab and Sind Bank IPO Review : In the last few months, many big ticket IPOs from the public sector like Coal India and MOIL have gone down well with the investors. Another public sector enterprise up for a stake sale is The Punjab and Sind Bank. Punjab and Sind Bank (PSB) is the last Government owned bank to come up with a Public Issue. It is expected to raise Rs. 480 crores through a sale of 4 crore shares. The price band of the issue has been fixed at Rs. 113-120 per share. The subscriptions to the issue will remain open from December 13 to December 16. For QIBs, the subscription will close on December 15. The object of the IPO is to augment the capital base to meet the future capital requirements arising out of the growth in assets due to the growth of the Indian economy. Through the issue, PSB is also focussing on enhancing the visibility of its brand name among existing and potential customers. The New Delhi-based Punjab and Sind Bank, having a banking experience of over 100 years, is one of India’s smaller public sector banks, with a total asset size of Rs.58,421 crore as on September 30, 2010. In the annual Business Today-KPMG survey of Best Banks in India 2008, PSB was ranked number one on the list of ‘Small Sized Best Banks in India’. During the last five years, the balance sheet of the bank has grown in size by leaps and bounds. Its financial numbers are also quite impressive and at par or at times even better than the industry average. Over the last five fiscals, PSB’s advances have grown at a CAGR of 36.24% and its total deposits have grown at a CAGR of 28.24% .Significant improvement in asset quality is also seen during the same period with its net NPA getting reduced to 0.36%, compared to the net NPA of 8.11% as on March 31, 2005. Return on Advances as well as Return on Assets of Punjab and Sind Bank are better than the All bank’s average and other public sector banks. Also the Net NPA ratio of PSB which stands at 0.32 is significantly better than the all bank’s average of 1.05. 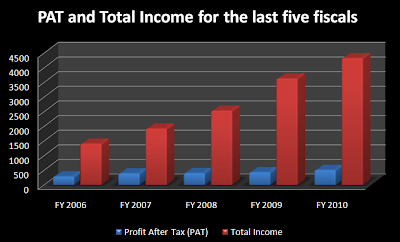 In the FY2010, Profit After Tax (PAT) of PSB stood at Rs. 506.82 crores for a Total Income of Rs. 4326.30 crores. These numbers are far better than its performance in the FY2009 when its PAT was Rs. 430.20 crores for a Total Income of Rs.6330.71 crores. 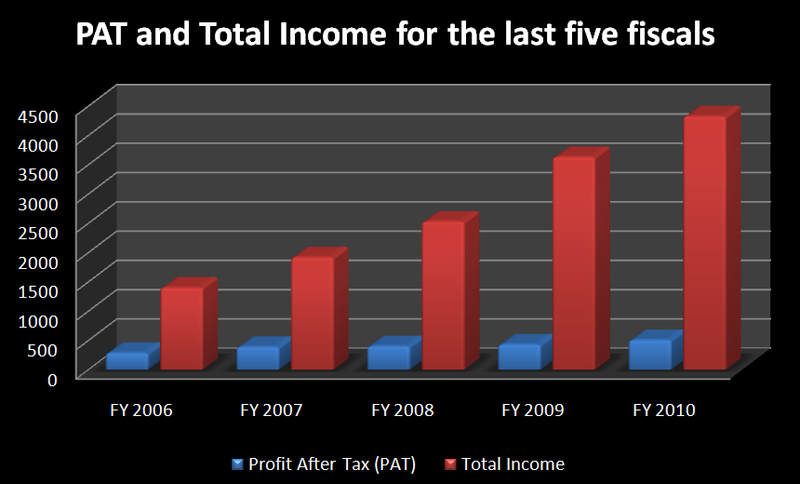 The following table clearly illustrates the remarkable growth in the income as well as the profits generated by the bank during the last five fiscals. PAT has grown steadily from Rs. 285.68 crores in the FY 2006 to Rs. 506.82 crores in the FY 2010. Also there is a steep increase in the total income of the bank which stood at Rs. 1401.93 crores in the FY 2006 and shot up to Rs. 4326.30 crores in the FY 2010. Fair Valuation : At a price band of Rs. 113-120 per share, the issue seems to be fairly priced. Assuming the higher end of the price band to be the issue price, i.e. Rs. 120 , with an EPS of Rs. 27.01 for the FY 2010, the P/E ratio of the bank comes out to be 4.44. Taking a more conservative approach and considering the weighted average EPS of PSB at Rs. 16.77, the P/E ratio of the bank now comes out to be 7.15 which is very much near to the average banking industry P/E ratio of 9.20 and the average P/E ratio of its peer group ( i.e. other small sized listed banks) of 8.0. Risk Factors : Apart from the various internal and external risk factors associated with the Indian economy in general and the banking sector in particular, PSB is exposed to two other risk factors which may hamper its growth as compared to its peers. The first one being its regional concentration in Northern India. Out of a total of 920 branches, 623 branches are located in Northern India, constituting 67.72% of the total branch network. Any adverse economic condition developing in the northern region of the country can severely affect its operations. Secondly, its archaic banking system. The first CBS branch of PSB was rolled out on June 24, 2010, when many of its competitors are working on 100% CBS branches. This backwardness in the field of IT infrastructure can also impact its growth prospects and brand value. IPO Grading : Further, I would like to add that CARE has assigned a “CARE IPO Grade 4” to the proposed IPO of PSB. CARE IPO Grade 4 indicates ‘above average fundamentals’. CARE assigns IPO grades on a scale of Grade 5 to Grade 1, with Grade 5 indicating strong fundamentals and Grade 1 indicating poor fundamentals. CARE’s IPO grading is an opinion on the fundamentals of the issuer and represents a relative assessment of the fundamentals of the issuer. After going through the key fundamentals of Punjab and Sind Bank including its financials, valuation and the risk factors, its upto you to decide whether to invest your hard earned money in this IPO or not, after all its your money, and money matters a lot. Please feel free to share your thoughts about the upcoming public issue and its fundamentals. Your feed back would be highly appreciated. Punjab and Sind Bank (PSB) Listing: Punjab and Sind Bank (PSB) will be listed on the bourses on December 30th and may be the last listing of the decade. The issue had received an over whelming response and was over subscribed 50.75 times. Disclaimer : All the information and financial numbers published in the above review have been obtained from the DRHP of Punjab and Sind Bank filed with SEBI. MONEY MATTERS has only reproduced those numbers in a simple manner to assist you in taking better informed investing decisions. 10 Respones to "IPO Review & Analysis: Punjab and Sind Bank"
Nice Article indeed. Good to read such posts from you. A very nicely written, well-organized and informative review, thank you! Mr.Nandan - I was going through PSB's RHP. I could find their EPS table presented using weighted average. I wonder why they are concerned about it and if i try to do of for a individual year the EPS will be of very narrow growth.